In an election year in which Hispanic voters are crucial to Democratic success, the first feud of the now-official general election gubernatorial matchup is being fueled by state Sen. Wendy Davis' primary performance on the border. 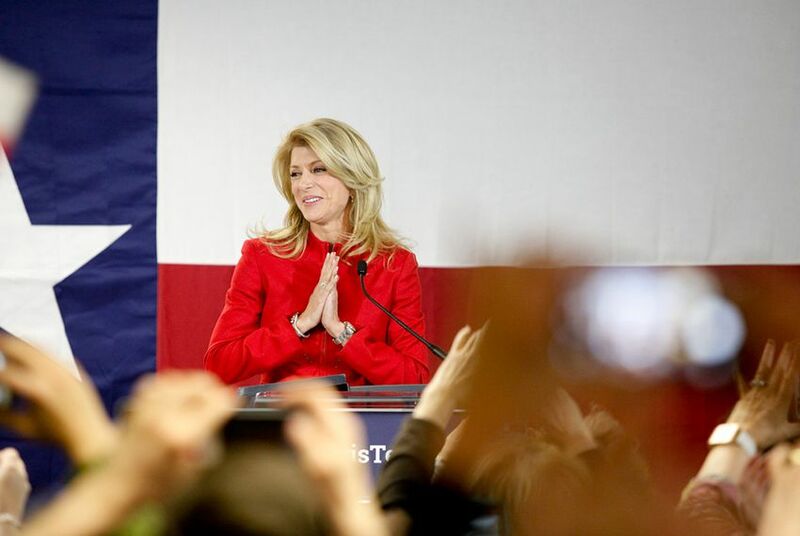 Editor's Note: This story has been updated to include a response from Wendy Davis. Davis, the Fort Worth Democrat who will face Republican Attorney General Greg Abbott in November, won the statewide nomination handily. But she lost several border counties with large Hispanic populations — including counties in the Rio Grande Valley and the Laredo area — to Corpus Christi Municipal Court Judge Ray Madrigal, a candidate with no statewide name recognition. According to a report filed at the Texas Ethics Commission, he also raised and spent no money on his campaign. Abbott campaign officials and allies were quick to jump on Davis’ losses in left-leaning South Texas — a region where Davis has campaigned and must come out strong if she hopes to be competitive in November. Her numbers, while well above Abbott's in those counties, boosted Republicans' argument that Hispanics may not be a given for Davis' camp. Abbott's first general election rally will be held this week in Edinburg, in the Rio Grande Valley. At a press conference at the SXSWedu festival in Austin, Davis said she's been to the border region multiple times already in her campaign "and I intend to be there multiple times in the future." "I know that I offer to the families, not just of people in the Valley, but all over the state, what they are hoping to see in terms of a forward-thinking vision to make everyone a part of the Texas promise," she said. Davis spokeswoman Rebecca Acuña attributed higher overall voter turnout on the Republican side to expensive and divisive primaries, but said Democrats would unite behind Davis in the general election. "Between now and November, the campaign will provide Texans with a clear choice and Wendy Davis will focus on the kind of schools, economy and jobs we need to keep Texas moving forward," she said. In Starr County, Davis won just 35 percent of the vote, compared with Madrigal's 65 percent. She lost to Madrigal by a margin of 1,296 votes out of 4,274 votes cast. In Hidalgo County, in the Rio Grande Valley, Davis lost to Madrigal with 47 percent of the vote, by nearly 2,000 votes out of about 36,000 cast. And in Webb County, which is farther north along the border, Davis and Madrigal went 44 and 56 percent, respectively, with Davis losing by 2,752 votes out of about 24,000 cast. El Paso County, on Texas' western edge, was a different story: Davis garnered 69 percent of the vote, compared with Madrigal's 31 percent. Same with Cameron County, home to Brownsville; in that county Davis got 54 percent of the vote. On Tuesday night, Abbott’s chief political consultant, Dave Carney, made several statements on Twitter suggesting that border counties had rejected Davis' candidacy, and calling into question mobilization efforts made by Battleground Texas, a Democratic group working to make the longtime Republican state competitive. Battleground spokesman Ellis Brachman said the primary election wasn't a test for Battleground because the group has focused its resources on building support for the general election. He suggested Democrats are already "largely unified." South Texas is not exactly fertile ground for Abbott. While Abbott received far more votes than Davis statewide, Davis ended the night with more votes than Abbott in the same border counties she lost to Madrigal. In Hidalgo County, Abbott received 4,760 votes, while Davis got nearly 17,000. In Webb County, Abbott received just 725 votes, while Davis ended the night with 10,446. The Abbott campaign did not respond to a request for comment on Wednesday morning. But former state Rep. Aaron Peña of Edinburg, chairman of the Republican National Committee's Texas engagement team, attributed Abbott's low vote total in border counties to local races, which are largely Democratic. Because Texans are required to choose a party in order to vote in the primary, Peña said many Republicans were not able to cast a vote for Abbott. "The real challenge is in the general election because everyone is on the same ballot," Peña said. "I'm anticipating that Abbott will gain record percentages in the Hispanic communities. ... He'll surpass the 40 percent mark." Abbott has said he's aiming to win at least 40 percent of the Hispanic vote in November. Exit polls indicated that Gov. Rick Perry received 38 percent of the Hispanic vote in 2010. Given Texas' shifting demographics, Hispanics — who make up 38 percent of the state population today but are expected to be a plurality by 2020 — are in high demand for both parties. Both Davis and Abbott have talked about the importance of Hispanic voters in this election cycle and have made a big push to campaign in areas with large Latino populations. Abbott and Davis were both in Brownsville as recently as last weekend participating in a local festival, and have made several campaign stops along the border since the race began. Abbott staged his primary victory celebration at Aldaco’s restaurant in downtown San Antonio. His campaign said the site selection was no accident: He is promising to go hard after the Hispanic vote. Earlier Tuesday he said that his campaign would pose a “real threat” to Democrats who are counting on Hispanic voters. On Wednesday, Davis said Abbott only thinks of the border region in terms of "needing more law enforcement there," and accused him of fighting redistricting battles "to try to silence voices of minority members across the state." Mark P. Jones, a political scientist at Rice University, said Davis' showing in border communities should be alarming for the campaign because of how crucial increasing voter turnout is to her candidacy. "These are dark blue counties," Jones said. "... She needs to be winning those counties with 85 to 90 percent of the vote."